Currently browsing posts filed under "Hal Steinbrenner ’91"
But Steinbrenner was unable to put a time frame on how long negotiations would take or hazard a guess on how smoothly they would go. “Who knows?” he said. “You just never know with these things. Both parties need to be happy with the deal, and that may make things more complicated, I don’t know. Jeter, 36, is coming off the worst overall season of his 16-year major league career. His .270 batting average, the lowest since he became a regular in 1996, is 44 points below his career batting average and represents a 64-point drop from his 2009 production, when he hit .334. His 179 hits matched the lowest total since his injury-shortened 2003 season, and his .340 on-base percentage was the lowest since his rookie season of 1995. On the other hand, he is the most revered Yankee since Mickey Mantle, I would guess (Yankee fans should weigh in here, since I am a lifelong Red Sox fan and am certainly not qualified to opine on this subject). He’s almost certainly a first ballot Hall of Famer, and the Yankees have nothing if not tons of money. The best solution, I suppose would be a short term contact which could keep Jeter’s salary close to where it is now, without the team assuming an undue risk of a total performance meltdown, but I don’t know whether Jeter would take something like that. Perhaps a 4-year, $40 million contact might do the trick. What do Yankee fans think? What should Hal do? Comments Off on How much is too much? Professor Sam Crane and I disagree about a lot of things, but we were both happy to see the Yankees win the World Series. 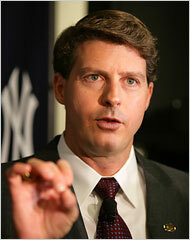 Here is Hal Steinbrenner ’91, who has taken over as managing partner from his father, George Steinbrenner ’52. Let me repeat my offer from last year. Are you an Eph interested in being a sports writer? Write for EphBlog! We have hundreds of readers per day and your beat would be the New York Yankees (and Hal Steinbrenner ‘91). If you don’t take up this offer, then you probably don’t really want to be a sports writer. And, who know, you might even get a book out of it, as Derek Charles Catsam ‘93 did from his Red Sox Diary series. And, if not the Yankees, then the Patriots or the Pirates. And, if not sports, then Senator Udall or soon-to-be Senator Coakley. An update from the New York Times on the Eph Steinbrenner’s: George ’52 and Hal ’91. Shhh. Don’t disturb him. Let him trample through the marshland undisturbed. You may take photographs and video and audio to your heart’s content, but please do not do anything harmful to this endangered species. For a while, there were fears we were losing the awesome roars and fearsome wallowing and general flailing of the dangerous “upright keratinous horns on the snout” (to quote the Merriam-Webster Online Dictionary). This impressive mammal seemed on the verge of extinction, a victim of enlightenment and manners and corporate groupspeak. I am speaking here of rhinoceros steinbrennerus tampafloridus, a rare breed apparently making a comeback in its native habitat. The beast is back, in the person of Hank Steinbrenner, Rhino the Elder, not to be confused with Hal Steinbrenner, Rhino the Younger. Are you an Eph interested in being a sports writer? Write for EphBlog! We have hundreds of readers per day and your beat would be the New York Yankees (and Hal Steinbrenner ’91). If you don’t take up this offer, then you probably don’t really want to be a sports writer. And, who know, you might even get a book out of it, as Derek Charles Catsam ’93 did from his Red Sox Diary series. EphBlog is powered by WordPress and delivered to you in 0.956 seconds using 29 queries..